With everyone having busy lives and loads of distractions during the day, most people are glad to get any sleep at all. Once their tiresome working day is over, people want only one thing – to get under the sheets and get a good night's sleep. But what about the position that you’re in while sleeping? Most people don't think about that once they're in bed, but you should know that some positions could actually allow you to sleep better at night. When it comes to sleeping on your stomach, many people are wondering if that position is damaging to their health. The short answer to this question would be – yes, it is. Even though it can help prevent sleep apnea and reduce snoring, this position has a negative impact on your back and neck (read more), which leads to poor sleep and the feeling of discomfort throughout the rest of the day. We don't even have to say how bad this position is for pregnant women! As you've probably already heard, many people who sleep on their stomach experience some kind of pain – whether it is in their joints, back, or neck. It is sure to affect how much sleep they get during the night. Such pains usually lead to waking up in the middle of the night, directly affecting the amount of sleep that you'll get, which then leads to a feeling of discomfort during the rest of the day. According to one medical research group, sleeping on your stomach is bad for to your back, as it places a certain amount of strain and pressure on your spine. The reason behind this is the fact that the middle part of your body is exactly where most of the weight is, making it difficult to maintain a neutral position of the spine during the night. This stress on the spine leads to increased stress on the rest of your body structure and, additionally, to pain in all parts of the body, since the spine could be considered as a pipeline for the nerves. It also leads to sensations such as numbness and tingling, which are rather uncomfortable. Just like with the spine, sleeping on your stomach may also cause neck problems. Unless you manage to find a way to breath through the pillow, you have to turn your head to one side when you're sleeping on your stomach. This causes your neck being twisted, putting your spine and head out of alignment – leading to some severe damage. You probably won't notice this damage after only one night, but the problems will unquestionably become evident over time. Suffering from neck pain? Here are 10 pillows that help alleviate neck soreness. One of the biggest neck problems that you certainly don't want to experience is the so-called herniated disk. This issue appears when the spinal vertebrae shift enough to cause a rupture of the gelatinous disk inside, causing the gel to leak out and irritate the nerves. This is very painful and requires professional treatment to heal. Even though the very thought of a woman in a late pregnancy stage sleeping on her stomach is unthinkable, it should also be avoided in the early stages of it. When a pregnant woman is “sleeping for two,” she needs to get as much good-quality rest as possible, and that extra weight that she has around the middle of her body increases the pull on the spine. This, of course, leads to acute back pain, and we don't even have to tell you how bad that is for the baby. If the baby is not squeezed between the mattress and the spine, the baby will have more room, which is exactly what a baby needs to develop healthily. A medical study from 2012 suggests that when a pregnant woman is sleeping on her left side, the healthy blood flow will be increased and thus provide the optimum levels of oxygen for both the baby and its mother. If you would like to make it easier for you to stay in this position check our recommended maternity pillow picks. Always use a thin pillow, or don't use a pillow at all. 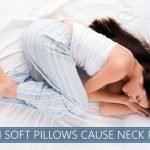 The flatter the pillow, the less angled your neck and the head will be. Choose a mattress designed for front sleepers. Typically, that means a slightly firmer than average bed. It will allow you to get a good night's rest on your stomach. Putting a pillow under your pelvis is guaranteed to help. It will keep your back in a more neutral position, taking the pressure off your spine. Two to three minutes of stretching in the morning will help you to put your body back into alignment and strengthen the supporting muscles. Always start the stretching session with a little bit of warm up, and be gentle! There are quite a large number of people who sleep on their stomachs, despite the disadvantages of this position. We're pretty sure that mothers-to-be won't do such a thing, but the rest of the people who sleep in this position are putting a strain on their spine and neck, which might result in herniated disk disorder or nerve problems. If you're among those people, we would advise you to try changing your sleep position as soon as possible to avoid these severe consequences. Of course, you don't have to do it immediately – try lying on your back or your side while you're relaxing during the day, and then it might just become your habit during the night. If it still doesn't help you, check out the tips mentioned above, which will, at least, help you avoid the possible complications. Thanks for an amazing comment Tim! Appreciate it. I’m curious about the above comment because I too, have always slept on my stomach and have a more flexible spine than average. Now I’m wondering if there’s a genetic component to it. Do agree with not using a pillow and a firmer mattress. Have always preferred both of those.